Shared Lives – A new way to live, a new way to care. Have you ever thought about becoming a Carer? Have you got skills, and experience in working in the community or in healthcare? Are you the type of person who is naturally very caring and wants to make a difference to other people’s lives? If so, then you may want to consider opening up your heart and home and becoming a Shared Lives Carer. Shared Lives want everyone who needs support to live well and enjoy the experience of living in an ordinary home with people who choose each other. Becoming a Shared Lives Carer is both a rewarding and flexible route into adult social care. An adult who needs support or a place to live moves in with, or regularly visits an approved Shared Lives carer, after they have got to know each other and the local Shared Lives scheme has matched them for compatibility. The goal is to provide an ordinary family life, with everyone involved contributing to real relationships. This relationship between carer and service user is so important in order for both parties to get the most out of this arrangement. It gives the adult a sense of ordinary family life in a stable, safe environment whilst also giving them the opportunity to be able to work, play, learn and socialize as they like. Carers are able to offer services based on their own level of experience, their circumstances and of course, their availability. You might have experience from healthcare, working in the community or with disabled people, or just have common sense and be an open, caring person looking for a new challenge, if so Shared Lives would love to hear from you. So who can apply to become a Shared Lives Carer? Well, firstly you have to be over 18 years old to be considered. Carers can be with or without children at home, single people, single parents, grandparents, people who are working or unemployed and from all ethnic and cultural backgrounds, there’s no discrimination and everyone is appraised individually and be carefully assessed, including a full DBS (police) and health checks. Throughout the process, carers will be supported and guided by a key support worker who will provide full training and guidance throughout their time as a Shared Lives Carer in relation to the needs of the person they support. 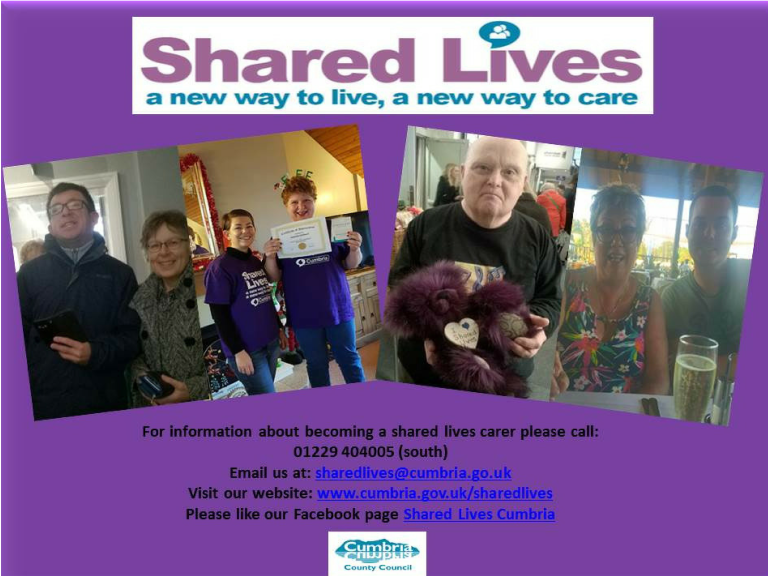 Shared Lives carers receive a weekly fee to cover the rent, household costs and care and support that they offer to the person placed with them. Whether you can provide a long term placement, short breaks or day support and you’d like to open your home and your heart help support and nurture someone in your community, the Shared Lives team would love to hear from you.